I alway love the body style on the Sport Gen2.5. 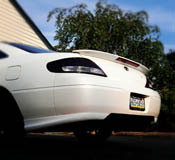 Updated look, Lip Kit, more sportier lip trunk spoiler, LED tail lights, etc... If I would want a Gen 2 it would look similar to what you have. That's if I could find a clean one but, so far I'm enjoying this 99 Solara. This one was just too nice to pass up. I was looking at a Mazda 3 and then my attention shifted to this. I drove it and had to have it. Plans down the road include lowering, wheels, intake and exhaust. Nothing too insane. I'll probably tint the tails and blackout the headlights as well. to be honest, I like the clean look of this gen too. Personally I would keep the tails the way they are, and only do the blacked out housing for the headlights. The color of the car matches with the tails. SteveSolara wrote: to be honest, I like the clean look of this gen too. Personally I would keep the tails the way they are, and only do the blacked out housing for the headlights. The color of the car matches with the tails. If I had that car this is what I would do regarding lighting.... Eyelids for the headlights and a light tint on the rear tail lights prefer film only so its removable (Don't go too dark maybe just a light to still have that red). Here's the eyelids I'm talking about. Last edited by DSM_Lara on Thu Aug 02, 2012 4:46 pm, edited 2 times in total. WOAH! That is some eyelids!! DSM_Lara wrote: If I had that car this is what I would do regarding lighting.... Eyelids for the headlights and a light tint on the rear tail lights prefer film only so its removable (Don't go too dark maybe just a light to still have that red). I was actually thinking a light tint w/ film. I hate the spray bomb stuff from niteshades. It fades and dulls after a week. Thanks for sharing the eyelids as well. I may have to do that. welcome. i haven't put my eyelids on yet but someday! i've considered taking the tints off my tails too but for now the black on black theme works. the 2.5 tails peek through the tint hella nice. Welcome. Was your short throw the same as the tC?